Have you decided how you will decorate your table for Thanksgiving this year? I'm not hosting Thanksgiving at my house, but I've found some great inspiration for beautiful Thanksgiving tables! If you don't know where to start, I'd suggest looking through and taking note of what you have: serveware, vases, table linens, votives, jars, twine, chargers, candles, even natural things like twigs, nuts, fruit, pinecones, etc. You might be surprised with what you can do with things you already have on hand. Next, browse magazines, Pinterest, and blogs to get some inspiration. Mix elements that you like, remembering the items you already have. Finally, gather what you don't have and play around with it until you find something you like. matching dishes, because it draws the eye away from the table a bit. things like twigs, burlap, twine, or berries can help with this. and vases to make it more Thanksgiving-y. up your table, and they also make pretty place cards. incorporate jewel tones and fall hues within the bouquet. Create layers at each place setting with a charger and dishes. Use boldly colored linens to contrast against your china. crisp linens and a simple place card. Where are you finding your Thanksgiving table inspiration? Too bad I'm not hosting a thanksgiving this year, but I think I'll use some of these ideas for non-Halloween fall decor! Oh I love table number 2! I find inspiration in smell. We got a new Autumn Leaves candle and I want to cook and decorate like crazy! I have always had a preference for gold pumpkins:) I love each and every one of these ideas! I have small champagne pumpkins I am hoping to use! Love the last two pictures! The pears are a great idea. 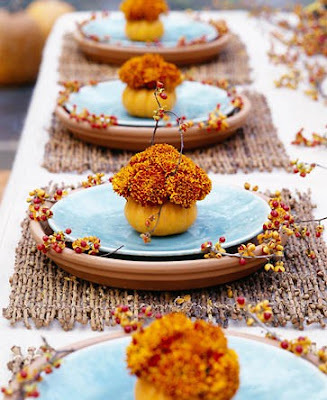 I love the natural table setting...I never would have thought to mix light blue into thanksgiving colors! love all these ideas... but the gold pumpkins are my fave! I'm totally loving the spray painted gold pumpkins. So easy and so classy lookin. Oooh I love the little gold pumpkins! Nice sparkly touch! I love the idea of a simple table with flowers and unscented candles! love this! i especially like the cornhusk votives and cases with the mauve roses. swoon. um....my table in my apt fits probably one mini pumpkin on it before getting too crowded for two place settings. that's real talk there sherri. What wonderful inspirational pictures! I love tablescapes, but often do not have the time to make it so perfect looking! One day! Hope your day is going well! I really love the corn husk idea...such an elegant and simple table setting! Oo i love the votive candles! So pretty! These are wonderful ideas! I would have never thought about corn husks or spray painting pumpkins. Love! I love all these ideas! As it will just be the husband and I for Thanksgiving this year, I may use some of this for just the two of us. Really, really love that first photo! Such beautiful and festive decor ideas! I can't even pick a fave because I would be delighted with my table looking like any of them. Fun fall place settings, I love all of those ideas! Beautiful decor! I am having Thanksgiving at my house this year and I'm not sure how I'm going to decorate yet...yikes!